truApp blog | Your story cannot be told in bullet points. Your story cannot be told in bullet points. Meet Erik Torenberg, co-founder of rapt.fm. A recent University of Michigan grad, one look at Erik’s truApp profile shows just how accomplished this young entrepreneur already is. Erik and his team of 7 are currently working to provide a platform that could lead to a freestyle revolution — think rap battle meets chat roulette. This week Erik sat down with us to talk rap, entrepreneurship, and impart some words of wisdom about the power of online portfolios. So Erik, what exactly is rapt.fm? Rapt.fm is a real-time video rap battle and cypher website. Imagine video chatting but with beats in the background and a live audience of up to thousands watching and voting for the winner. It’s a community for rappers to improve their craft, gain exposure, and have fun. How did rapt.fm get started? Rapt.fm started in January during Startup Weekend Ann Arbor; since then we’ve moved to Detroit. We received early funding from Bizdom. I love to rap, and believe freestyle fosters creativity, introspection, and collaboration. I want to spread that, whether you’re an aspiring rapper trying to make it or someone who wants to have some fun with your friends in a novel way. What inspired you to start rapt.fm? It was just an idea I had for a while. I didn’t think it’d be good at first. At Startup Weekend, I only said the idea after they begged for ideas. I didn’t realize there were so many other people who loved to rap. At first, I wanted to build it for my friends, and then I realized it had market potential. We’ve been in a few schools and want to go to more schools and teach freestyling, rapping, and poetry. We want to show the connection between rap and literacy, and how important having a strong vocabulary is for rapping. What do you hope the future holds for rapt.fm? We hope to bring tremendous joy and spontaneous creativity and fun to lots of people from the aspiring rapper to the fan who appreciates quality rap to the casual user who just wants to have fun with their friends. We hope that people explore their love of rapping and self-expression. We hope for this site to be international. China has one of the biggest rap markets. We hope to bring the joy and creativity that we experience among us friends to the world. What’s one thing about you that wouldn’t stand out on a traditional, black-and-white resume? I love to freestyle (video below). Why should someone get a SEELIO? It is the only way to represent yourself online that holistically shows what you’ve done, where you’re going, and what you believe in. Make sure to check out rapt.fm, launching this fall! RIP truApp. Long Live Seelio! Today we are excited to announce the transition from truApp to seelio! Our new name, seelio, comes from the combination of see + portfolio. The new site and name will launch within a month. All current truApp accounts will transfer directly to seelio.com at that time! Existing truApp links (e.g. truApp.me/mosesklee) will automatically direct to your new page on seelio (e.g. seelio.com/mosesklee). Over the past 6 months, we’ve taken into consideration the feedback from all of you and can’t wait to show you our new product. We truly believe that seelio will be that stage for college students to distinguish themselves and connect with companies. By looking at all of the work that University of Michigan students have uploaded to their truApps, it is very evident that there is a lot of talent present at the University. Today, we look at several students who have taken their talents across the world. It has become more and more common for students to study abroad as well as work or intern in cities or countries outside of their comfort zones. Students do so to immerse themselves in different cultures and explore what othe cities have to offer. Check out what some students are working on this summer! Q: Where are you working this summer? What do you do on a day to day basis? Olivia: I’m working at HEC Paris, a business school with MBA, Masters in Management, and Executive Education. Each day I go to the office from 10-5, and I have work on short-term projects assigned to me from the development manager at the school. Right now I am working on a project on how to develop HEC’s presence in North America by reaching French teachers, International Centers, and Business and Student organizations. I am developing a presentation on specific ways to increase this presence and make HEC’s programs competitive in the US, as they are ranked #1 in Europe but not a popular choice among American business students. I’ve also worked on social media and online development as well as how to improve campus life. Tarrence: I’m interning at Samsung Electronics in Suwon, South Korea. I’m working within the Mobile Services R&D dept. and developing an education solution for Samsungs Android tablets called Smart School. I get on campus (called “The Digital City”) around 8am, grab breakfast (we get fre breakfast/lunch/dinner), and am in my office by 8:20. I spend most my day developing different components for Smart School. The environment is pretty laid back and I work independetly for the most part. I grab lunch with some other interns or my team and take a coffee break in the afternoon sometimes (Koreans live off coffee, the campus has probably 10 different cafes). I spend about 9hours in the office and get back to my hotel around 630. Charlotte: This summer I’m working in Brooklyn New York for Living City Block, an urban planning organization that designs systems on a block scale level to focus on energy and resource efficiency, storm water management, and community connectivity. My main project will be using the systems, data, and maps the organization used in Denver and applying them to neighborhoods in Brooklyn in hopes of making industrial areas more resource-efficient. It’s a long-term project, but I’m happy to be contributing this summer! Additionally, I’m doing similar work with the Brooklyn Greenway Initiative, a project to redevelop 14 miles of the Brooklyn waterfront. Haley: I studied abroad/ was a research assistant in Zambia. My team helped a professor for the University of Michigan on her research project. It was called TMI, (Trusted Messenger Intervention) which aims to help educate about HIV and AIDS through a biological perspective by targeting clergy members of the AMEC (African Methodist Episcopal Church). By educating them and teaching HIV AIDS as a medical issue and not a moral issue, we hope they will educate their parishes to help increase awareness and VCT (voluntary counselling and testing) to get rid of HIV/AIDS. My work varied daily but in general we traveled around Zambia to AMEC churches and held 2 day workshops for church leaders. Q: How did you find your current job or internship? Olivia: I found the internship through a program called CIBER, which is affiliated with Ross. Students can apply for a number of international jobs depending on their country of interest. Tarrence: I found this internship and applied directly through Samsungs website. Charlotte: I learned about both jobs through my internship last summer with the Regional Plan Association, also in New York. Both of these projects were initiatives that RPA was interested in, so this I contacted the organizations directly and explained how I learn about them. After a handful of interviews with different members of the organizations, I was offered the position. Haley: The professor who is head of the project came into my virology lecture to tell us about the project and how to apply to be a part of it. Q: What do you like best about the city you’re interning in? Olivia: What I like best about Paris is that it’s easy to get lost! Paris is huge, separated into arrondissements and it would take weeks to experience the whole city on foot. Getting lost sounds like it would be scary, but it’s actually the best thing you can do living in a city like Paris. When you’re not looking, you can easily stumble upon things you wouldn’t have otherwise found, such as unique shops, delicious bakeries, or hidden cafés away from the bustling streets. There is also so much to appreciate here when the city is in bloom, because there are tons of parks with endless flowers where you can sit and have a picnic. Charlotte: Brooklyn is an incredible place! There are so many great outdoor bars and restaurants, creative businesses, plenty of live music, and great views of Manhattan. You’re a ten minute subway from Manhattan too, where there’s always a ton going on, but Brooklyn is less crowded and a little more chilled out compared to Manhattan. Haley: We visited multiple cities, but the project was based in Lusaka, Zambia. My favorite part about Lusaka was the people in general and how alive the city was. Q: Why should someone get a truApp? Olivia: Truapp is very different from other social networks I’ve seen becuase it focuses on the professional side of a student but still lets them showcase who they are through their experiences. It’s a great way to set yourself apart for recruiters through visual proof of your accomplishments. Tarrence: TruApp is a unique way to differentiate yourself in an increasingly competitive job market. It allows you to display skills that are hard to describe on a resume. Charlotte: It’s nice to be able to send your profile to a potential employer, as they can get an idea of what you’re like both as a an employee and as a person. Many businesses and organizations, especially newer, urban ones, value the perspectives of their younger employees. Truapp also gives you a chance to set yourself apart from you grades and resume by allowing you to lay out your experiences in a more personable way. Haley: TruApp is nice because it gives people an opportunity to show employers things that they couldn’t typically put on a resume. Meet Max Moulton. Former foursquare campus ambassador. Now – it’s his time to move up the ladder. truApp is thrilled to announce his addition to our team as our campus ambassador at Michigan State University. A social media guru – Max is not new to the world of tech and social media. Q: So, Max, why are you excited to work for truApp? atmosphere. This idea is truly a unique approach and has great potential to take MSU’s student body by storm. I’m glad to be a medium to connect the company with the students. Q: Why should a student like yourself get a truApp? Everyone should get a truApp because #resumessuck! But really, a standard resume does not accurately display your skills, abilities, experiences, personality, or past work. Black ink on a white piece of paper is just a bunch of words. With truApp, you’re able to showcase so much more of yourself to employers. It’s great that this site was also created by students who truly understand this for other students. It’s catered more towards the emerging college student instead of the established networking person in a dedicated career. That alone is what appeals to me personally the most. Q: If you had to choose, what’s the best part about being a Spartan? The best part of being a Michigan State Spartan is just that. I am a Spartan and I always will be. I feel like I’m part of one giant family. I know that whenever I meet another Spartan I will instantly have something in-depth and rich in common with them. Q: Tell us something interesting or unique about y-o-u! Something interesting about myself is that I hate being in my comfort zone. I can’t experience new things if I don’t push myself to get out there. Life’s all about experiences; good or bad. Sparty on! Another new campus ambassador joins the team. Meet Ricky Hernandez. 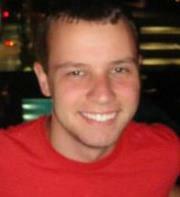 He’s a Michigan State student pursuing his Bachelor’s degree in Communications. Today, he begins bringing his talents to the truApp family. Beginning in our inaugural class of campus ambassadors, Ricky will help show the Spartans all the value and promise truApp has to offer. Watch out for this one. A self-motivated go-getter and Entrepreneur himself, Ricky represents the kind of talent we love to see on the site. Even more, the kind of talent we are excited to have on-board, working to help more students, on more campuses, every day. Q: Why are you excited to work for truApp? I am excited to work for truApp because I love thinking critically and I feel passionately about what is going on within the company. Q: What’s a good reason for someone to get a truApp? Someone should get a truApp if they feel that the old-fashioned resume is out of style. All the most popular online outlets are highly customizable and people are more interested in being able to ‘see’ what you can do as opposed to ‘read’ about it. Q: What’s the best part, in your opinion, of going to MSU? The best part about being a Michigan State Spartan is getting to live and learn on such a beautiful campus. East Lansing is stunning in the Summer. Q: Tell us something about yourself, totally unrelated to your new position or career aspirations! I am highly skilled in improvisational jazz on both the Alto and Soprano saxophone. Largely at the University of Michigan thus far, our neighbors to the West at Michigan State University are hungry to jump on the truApp band wagon. 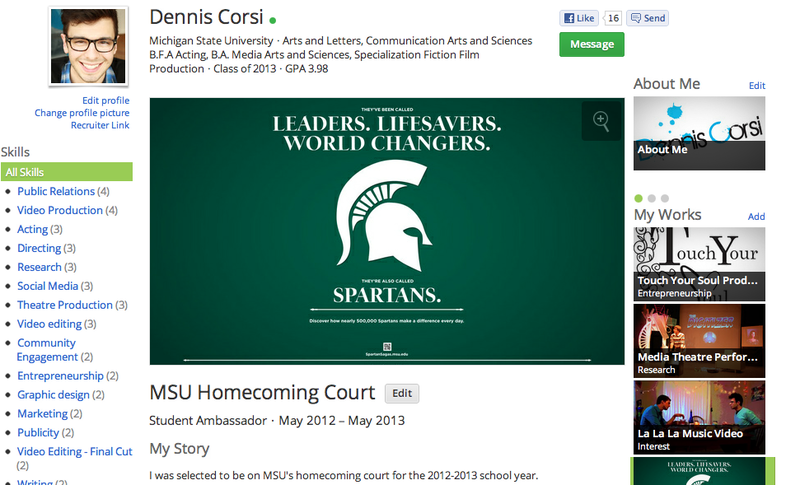 Dennis Corsi, a rising star out of East Lansing, Michigan, is joining the truApp team as a part of our first class of MSU Campus Ambassadors. He was the artistic director of Touch Your Soul Productions, worked Arts Administration at Williamston Theatre, and has participated in media theatre performance research. And it doesn’t stop there. Check out his truApp to see a little more about this unique fellow. But not before the truApp blog takes a second to sit down with Dennis and learn a little bit more about the path that brought him here today. Q: Why, in your opinion, should a student like yourself get a truApp? An online visual and interactive resume is such an awesome tool for job searching and for displaying who you are and what you do. A list of skills and past work experience doesn’t fully paint the picture of who you are as a human being. Employers aren’t hiring robots, they are hiring people. So get a truApp and become a person! I am excited to be a part of something new and promising! I’m a firm believer in making things happen for yourself instead of waiting around for them to happen. I want an online profile that features me well, so I’m going to help make that a reality! Q: What’s the best part about being a Spartan? The best part of being a Spartan is the family that I have fostered here. I have met so many amazing people through classes, study abroad, and student organizations. The passion that MSU students and faculty have inspire me to live a driven life. Everyone I have met here is now part of my family and I know I can count on them for support. Q: Tell us something else interesting about yourself! Even though I am a theatre and media major now, I used to be a premed and biomedical engineering major! Although I am still quite the science nerd, I found that my passion is with the arts. Brianna (leftmost) after a performance. Brianna Park is nothing short of a child prodigy. Shortly after beginning lessons, Brianna was already being recognized for her natural talent in piano performance. Though she is humble and does not usually show off her stunning musical talent, even a fleeting listen to the performances she’s uploaded to her truApp profile reveals just how talented she is. It’s also not every day that you meet someone with such a unique combination of majors (in piano performance and psychology), and what she plans to do with them is just as interesting. Read on to learn more about the child prodigy and soon-to-be professional pianist. Q: What made you want to study music? Brianna: My music path was never really planned; it was a very spontaneous journey. I was born and raised in Korea until age of 13, and learning how to play instrument was very popular in the nation. And because I was a timid child, my parents wanted me to engage in activities that would intrigue me. As I began to study classical piano, I fell in love with it and my natural ‘talent’ was discovered by my former instructors. I began to compete at age of 9, and though it was stressful, I enjoyed the fact that I was able to perform in public. As I attended High School for Performing Arts, I was exposed to professional level with the others, and seeing their aspiration to be professional musicians inspired me as well. I also learned that I could use music as personal and educational benefits as well.It wasn’t till my family moved to California that I’ve decided to pursue further studies in piano performance. As an immigrant, not knowing the language and culture boosted my insecurity. The only way I was able to comfort myself was through playing the piano, and this allowed me to explore broader aspects of music. It not only led me appreciate it more, but also communicate through it. My former instructors also inspired me to study music – their passion to teach and promote their knowledge really prompted my desire to study music. Q: What are your career aspirations? Brianna: Ever since I became a student at University of MIchigan, my career aspirations have been changing. I would like to be able to incorporate both of my music and psychological knowledge, meaning it could be anything. But ideally, I would like to be in special education field. Q: Which work are you most proud of? Brianna: I’m not particularly ‘proud’ of my works, but rather honored to perform them. I could say I was very proud of my collaborators for past chamber performances. I’m also proud of ensembles where I served as an accompanist! Q: Favorite song or composition? Brianna: I don’t think any of musicians will be able to name a single composition, since there are so many! For me, I really enjoy performing Chopin and Brahms’ compositions. I am also an avid fan of other kinds of music – these days, I really enjoy listening to Florence + the Machine. Q: Why is creating and maintaining a truApp Profile beneficial for students for studying the arts? Brianna: For musicians, a lot of us have struggle to connect with the others – I think maintaining a truApp profile will allow us to share our aims and paths. Brianna: Going to Salar de Uyuni in Bolivia!! Seelio has officially launched! Be sure to check out www.seelio.com to view truApp in its updated form!